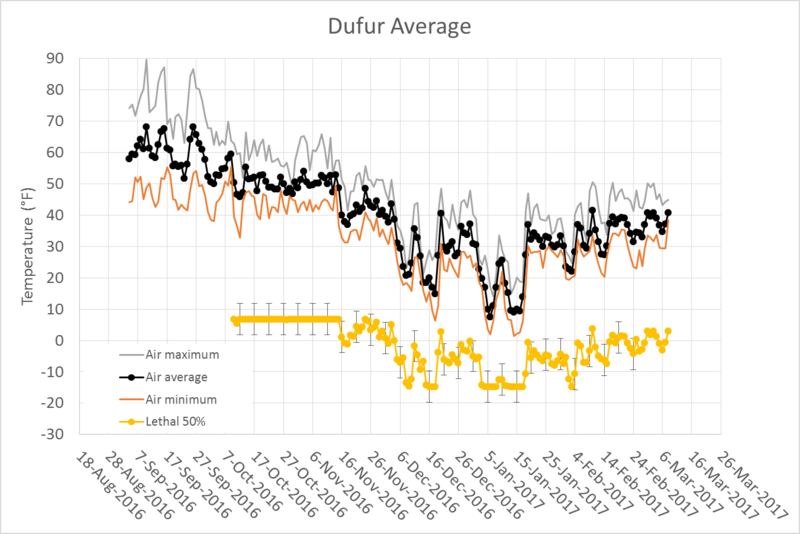 Differential thermal analysis (DTA) assessment of lethal temperatures in sweet cherry. 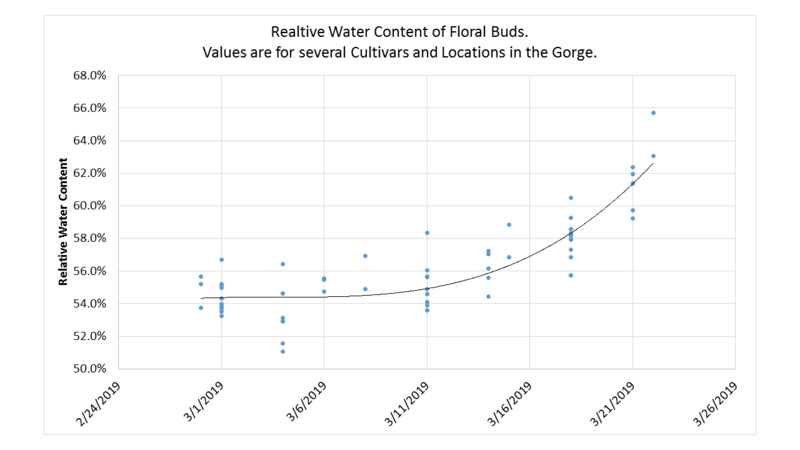 Relative water content of the floral buds used above in differential thermal analysis. Regina clearly lags in development compared to most other cultivars. 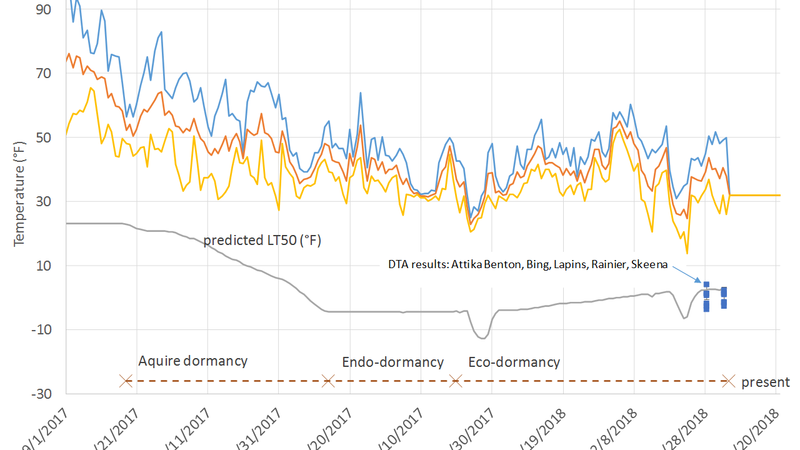 The trend of increasing relative water content shows that dormancy has broken in most locations of The Dalles and Hood River Mid and Lower valley. 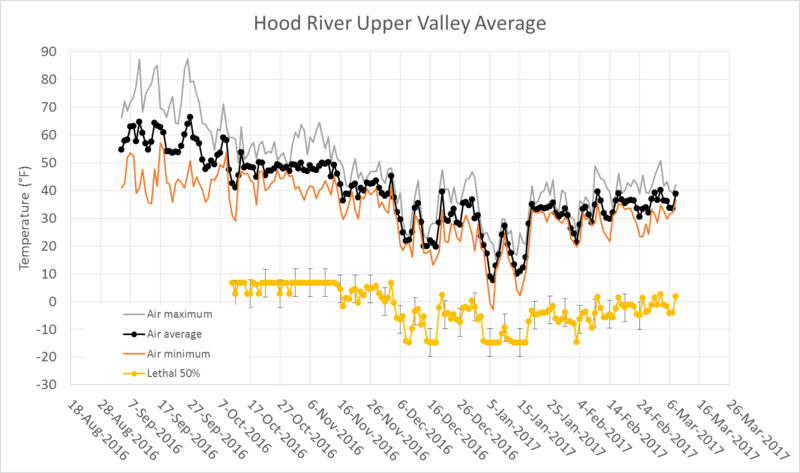 Hood River Upper Valley = 9; Hood River Mid Valley = 9; Hood River Lower Valley = 5; Mosier Dallesport = 3; The Dalles = 9; Chelan = 2; George = 1; Yakima Valley = 4; Tri-Cities = 8. 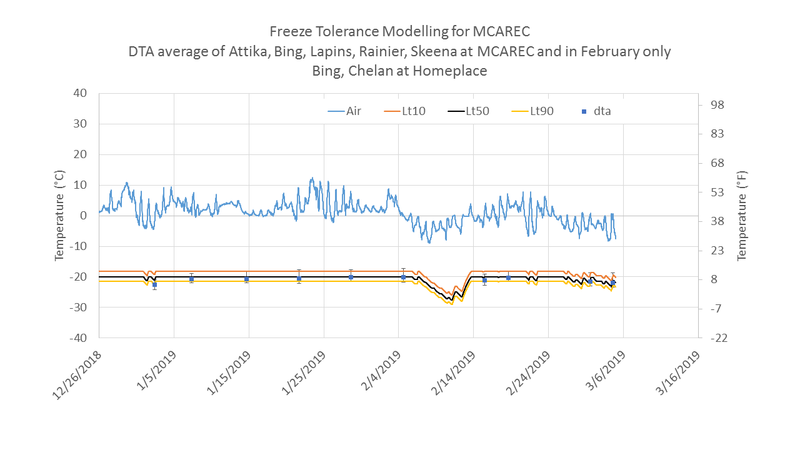 This updated version of FTEED includes the most recent (March 5, 2019 3:00 PM) experimental assessment of freeze tolerance using differential thermal analysis (DTA). 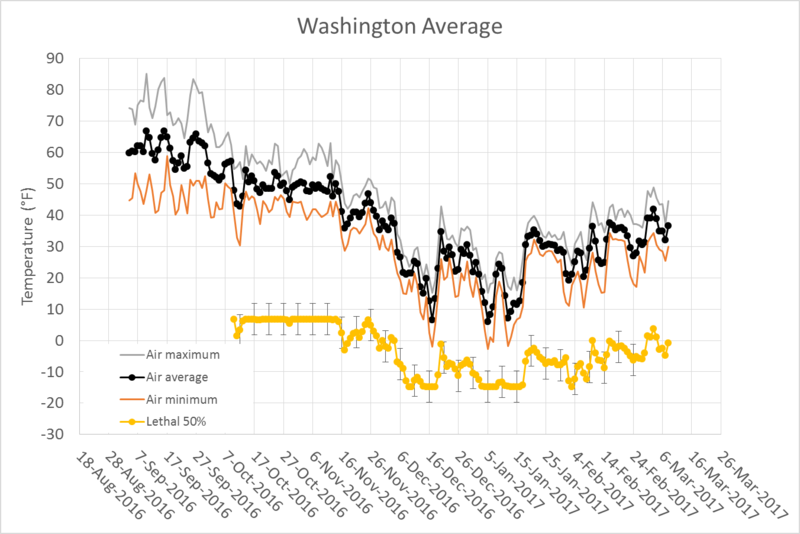 This model predicts the lethal temperature of sweet cherry floral primordia (triple lines). 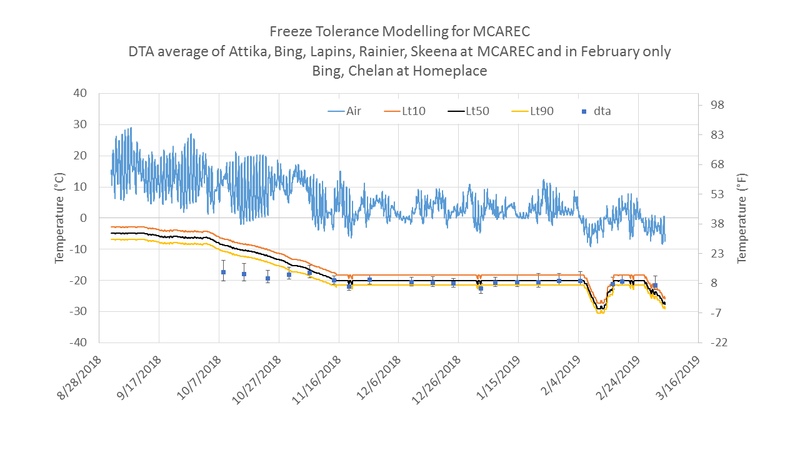 When the ambient air temperature (blue line) falls below the freezing temperature of buds (about 25 °C), the floral primordia acclimate to lower lethal temperatures. 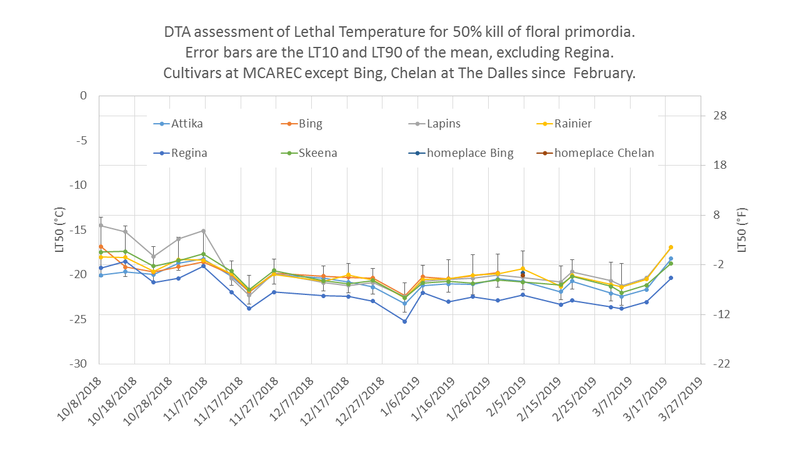 When the ambient air is above freezing, floral primordia deaaclimate to a warmer base value. This base value will begin to rise as floral buds awaken. The blue squares with error bars are experimentally determined values using differential thermal analysis (DTA). This model can be calculated with data from any nearby weather station. 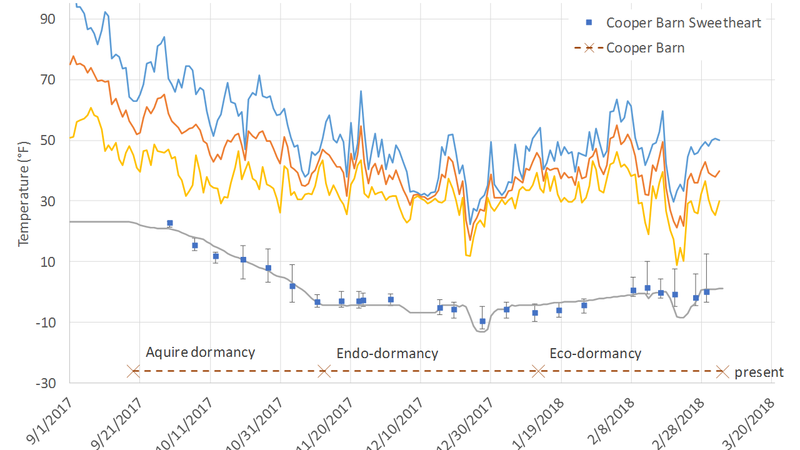 A development index is a physical trait that can be expressed numerically as a relative value. The model is an accumulation over time, of growing-degree units calculated from an asymmetric response curve. 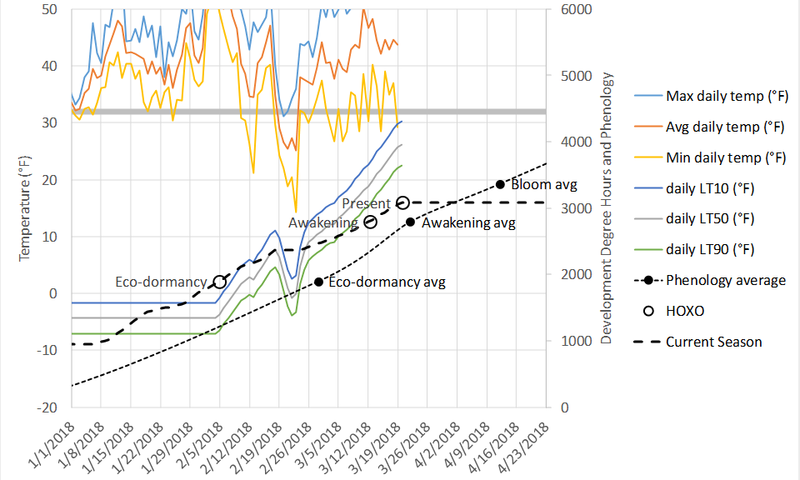 The graph below is specific to Sweetheart and can be used to assess the progression of development. Weather station data from 34 sites contribute to these models (Columbia Gorge Fruit Growers Weather Network). Information is listed from the start of winter Solstice until the current day (4/6/2019). The left axis lists the current date, and pertains to the different colored lines, referring to Gorge locations: Dufur, HR Upper Valley, The Dalles, HR Mid Valley, Mosier Dallesport, HR Lower Valley. The right axis lists relative water content (rwc). 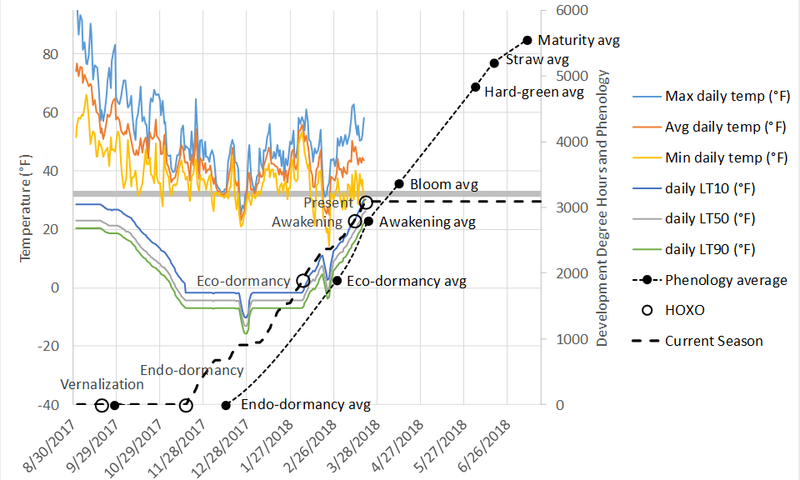 The model (blue line) uses rwc as a measure of bud/flower development. This axis will change as development progresses, to show bloom, diameter, fresh weight and redness of fruit. The two sets of lines both relate to the lower axis – hours from Winter Solstice. 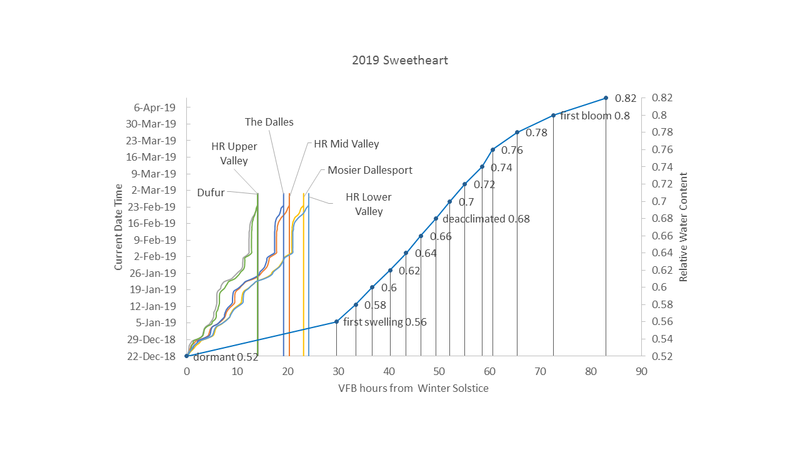 The intersection of the dropdown lines (Dufur, HR Upper Valley, The Dalles, HR Mid Valley, Mosier Dallesport, HR Lower Valley) with the model (blue line) is the predicted bud/flower development value (right axis). 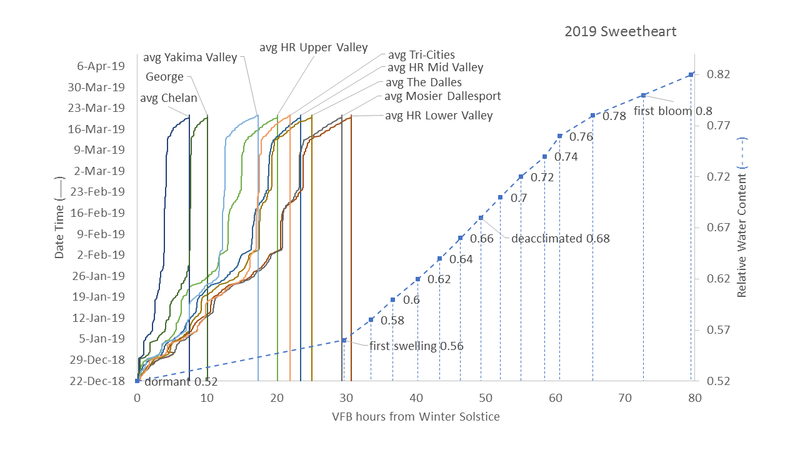 Using the model (blue line), first swelling is predicted to begin at 0.56 rwc (30 VFB hours). The fastest development at the moment is in the HR Lower Valley, having the warmest ambient air temperature at 25 VFB hours. 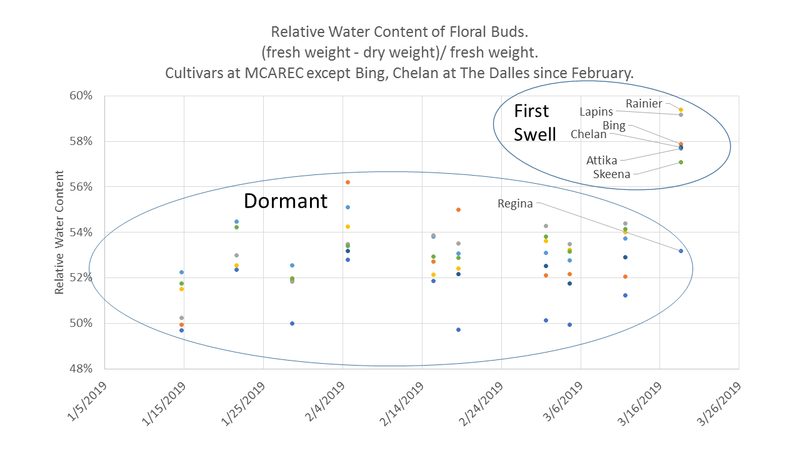 Currently, for all gorge locations sampled, none are out of dormancy.